I loved Mister Rogers growing up…actually, more after I had grown up and realized that, even though much of the world was not gentle and kind like he and his neighborhood seemed to be, I could choose to experience everything through a healthy curiosity and a genuinely optimistic attitude. Aww, he was awesome, wasn’t he? 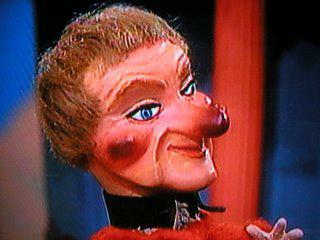 But I’ll admit that Lady Elaine Fairchilde, even though she scared the crud outta me, seemed also very nice. I think he had her made that way so we wouldn’t get too spooked out there by harmless things and would learn not to judge a book by its cover.